Fashion Month is officially over and now we all know what will be seen and worn around next Spring / Summer. Plenty of Trend-Comebacks and reinventions but also new new ideas to shake up the Fashion World! My personal favourite was the style that was already spotted last year: PINK. Only now you don’t have to stick to Rose Quartz tones only but can pick between bright pink, baby pink, bubblegum pink… really anything! And even if you're not into this whole girly quirly la vie en rose thing, believe me, you’ll get to it and then you won’t be able to think about other than PINK! Another thing that was seen in all the fashion capitals and on several major catwalks was the Extreme, as for example extreme sizes of bags, there where micro bags so small that not even your lipstick would fit in it (spotted at Valentino) and bags so big you could build a tent with them (seen at Acne). 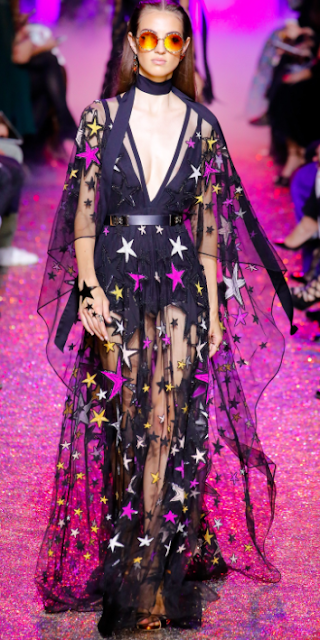 Another extreme were Stars, on both daily wear and formal wear (Elie Saab)! As already previously discussed here on the Blog, going all one colour, when creating an outfit is super fashion forward and was even proofed by Maria Grazia Chiuri on this years Dior Show (here)! Another extreme you should be looking out for is extreme use of belts (and corset similar Tops!) to define the waistline, for example while wearing a trench coat. Speaking of, the classic old Trench coat has been reinvented this season, instead of feminine cuts next year is going to be all about robust and masculine cut and also crazy bright coloured Trench Coats (as seen at Marc Jacobs). 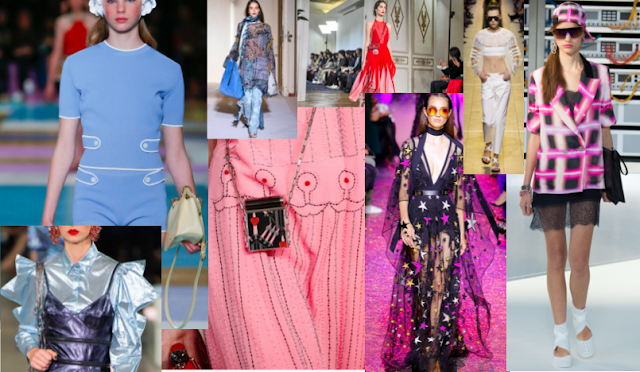 Maybe it was the Olympics or the long awaited release of Finding Dory, but Sea inspired clothes where a huge thing on many catwalks, especially @ Miu Miu! Fashion, especially la mode Parisienne has always been pretty classy, but when even the classiest of them all incorporates modern technology into their new collection, we know that it’s here to stay… and not only as seen at the Chanel show (here), but also on many others where the modern touch went in the direction of metallic fabrics and accessories, like Kenzos show that just screamed: shine bright like a diamond! So what was your favourite style? And which one do you think will dominate the streets next spring?